12th April 2010, an epic day, which witnessed not just the union of two souls deeply in love but also the menifestation of the phrase- LOVE KNOWS NO BOUNDARIES. We have heard this phrase quite often but there are only a few couples which symbolise this. One such couple is A pair of International Sports Performers- Shoaib Malik and Sania Mirza love story . How Shoaib Malik and Sania Mirza love story started ? So let’s find out how did this sweet love story of Shoaib Malik and Sania Mirza begin. It happened in Australia. Sania was thrashed out of the Australian Open and Pakistan had suffered a terrible defeat on the cricket ground by Australia. Doesn’t seem like a such a great trip, but this was the trip where magic happened. As for Sania Mirza she was at a very terrible point in life. She had just broken off her engagement, with her childhood friend, Sohrab Mirza. And this had somehow begun to affect her life, professionally. 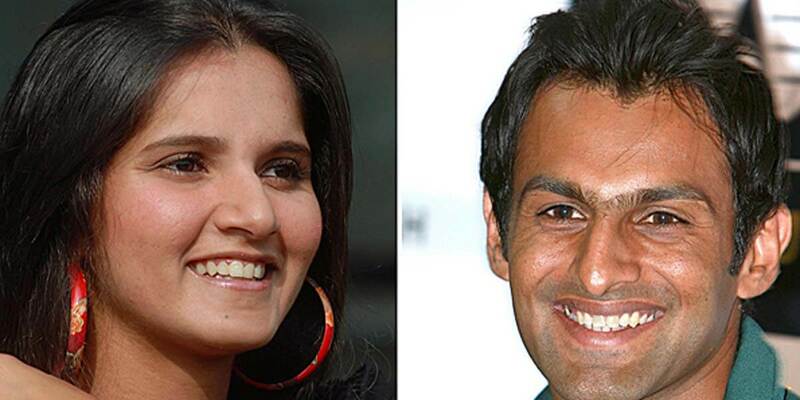 It is believed that Sania and Shoaib had seen each other just a couple of times before and now in Australia. And third time turned out to be a charm. Soon this couple was head over heals in love and decided to tie the knot just after 5 months of wooing. From the moment, this couple had revealed their relationship to the public, they had to face a lot of objections and threat. Their love for each other was opposed by many. Most commonly they were questioned on the basis of their patriotism, their responsibilities towards their countries, but nobody understood their deep love for each other. There were times when Sania was asked if she was going to change her nationality former to marriage and start playing as a Pakistan representative. But this couple didn’t pay any heed to any such shallow news. The couple understand and respect their own as well as their partners duties towards their specific nations. They don’t mix love and personal life with profession. Their understanding for each others nationality and profession is what keeps them together. To this Shoaib once said that he clearly understands how important it is to be an international sports person and he shall support sanai as long as she wishes to play. Who doesn’t want such a supportive partner. And finally that magical day came, 12th April, 2010, when the couple said ‘Qubool Hai’ and got forever tied in the bond of love. They set examples for other people as well. They stand as a representation of the fact that if you love your partner truly, god shall be by your side and give you the strength to fight through difficulties and be united with your love. Love overcomes all adversities.